We (Chengdu Local Tours) offer total service to plan and book your holidays in Chengdu and other popular China tourist destinations. We have many years of experience arranging itineraries for overseas visitors from all over the world, and we would like to share this experience with you. Our travel specialists understand that planning a trip to an unknown country can be a difficult and time consuming task, that is why we would like to offer you a helping hand. Chengdu Local Tours is run by Europe and America Department of Guilin China Travel Service, our team have wealth of local knowledge and experience on Chengdu and all China tourist destinations. At Chengdu Local Tours our aim is to help you explore Chengdu and other China top destinations and to ensure that your vacation is an unforgettable and trouble-free. We had put together a collection of our best-selling tour packages. Our core competence is and will continue to be in providing a totally focused, personalized and value-added travel experience for our clients. We having been delighted to receive many letters of appreciation from our clients. Please Click Here if you would like to read a few of them. Our tour packages cover the hot tourist attractions. You can mix and match them to suit your travel plans and extended itineraries that cover the most interesting and unique places. These itineraries range from 3 to 30 days and cover a wide range of China destinations with their "must see" attractions. Each itinerary also offers you a choice of 3 accommodation options to suit any budget. Our itineraries are suitable for individuals and groups. Please note that these tours' departure dates are fixed from late December to late February, you can only start your tour during this time period. Prices will depend on your choice of accommodation and optional sightseeing. We encourage you to book any of the itineraries as is and we can add or subtract nights from any of the itineraries depending on how long you wish to spend in each destination. Our friendly travel consultants are also happy to tailor make an itinerary to suit your personal requirements. As we have allocations on most of our travel products we can confirm city packages within 12 hours on normal working days if you book 21 days ahead. Less than 21 days ahead we have to make reservations on an 'on-request' basis which may take 24 hours or longer to confirm depending on the operator and whether or not a weekend or public holiday in China is involved. 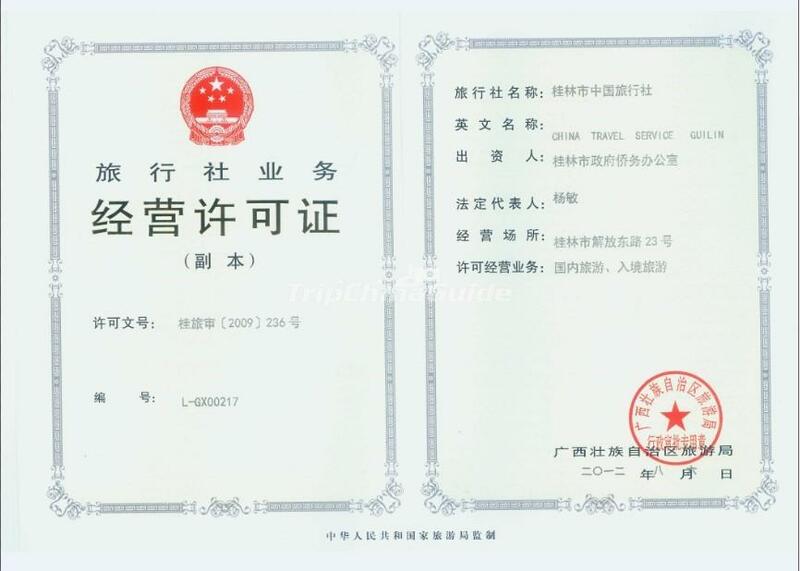 Europe and America Department of Guilin China Travel Service (China Travel Service Guilin) is a department of Guilin China Travel Service with responsibility for the English-speaking area market. At present the department runs 3 websites targeting at different markets. Guilin China Travel Service is a state-owned enterprise directly under the Guilin Overseas Chinese Affairs Office. As the member of CTS Group (China Travel Service Group), CATS (China Association of Travel Services) and ASTA (American Society of Travel Agents, ID Number: 900218750), Guilin China Travel Service operates inbound and domestic travel business. We provide comprehensive travel solutions for leisure, vacation, solo, group, charters & small business travelers, backed by real-time websites & unmatched products. 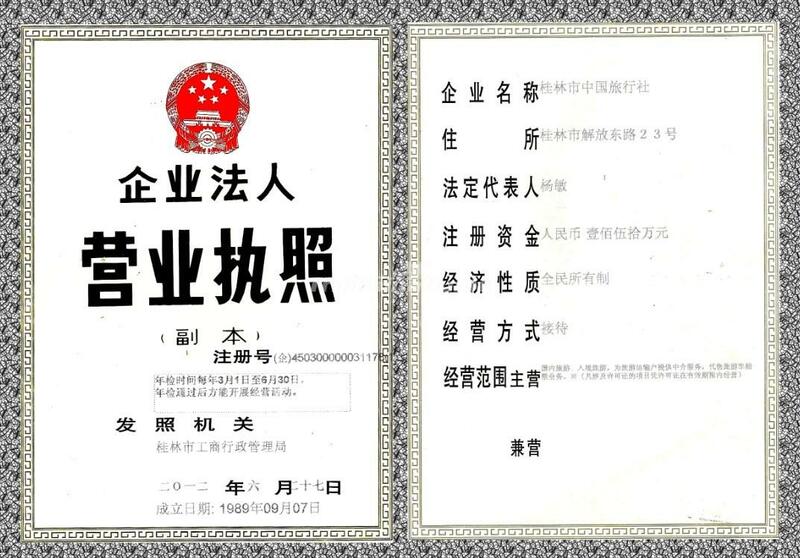 Since its inception in 1989, we have built 10 departments, and have been growing as one of the foremost travel companies in China. We are receptive to new ideas, flexible and adaptable to our clients needs. With our office in Guilin, we extend top of the class services to our prestigious customers from across the globe. Keeping in mind the lingual problem of our clients, we have now offer professional Chinese, English, Japanese, Russian, Thai, Cantonese, French, Indonesian, Malaysian speaking tour guides. The company is headed and managed by people with a rich experience in the hospitality industry. We cater to different markets namely North America, Europe, Australasia, Southeast Asia and some other leading markets. We offer all types of packages - luxury, standard and budget - with personalized services within China and the neighboring countries. We are experienced in providing tailor-made cultural, history, religious, honeymoon, family, business, festival, adventure, and holiday tours, along with other basic packages of Beijing, Xi'an, Shanghai, Shuzhou, Hangzhou, Nanjing, Huangshan, Guilin, Kunming, Chengdu, Luoyang, Datong, Lhasa, Urumqi, Guangzhou, Shenzhen, Harbin, Hong Kong, Macao, and many major tourist destinations in China. Guilin China Travel Service undertakes domestic air ticketing and domestic train, land transport by road. We also arrange cruises on Yangtze River, Li River and many other famous river and lakes in China.